Donald Trump was born in New York on June 14, 1946. 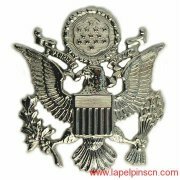 He is a Republican politician, entrepreneur, and businessman, and the 45th president of the United States (US flag pins). After graduating from the Wharton School of the University of Pennsylvania in 1968, he entered the company of his father’s real estate company and began to take charge of the company’s operations in 1971. He officially entered the business world and was known as “the king of real estate”. In addition to real estate, Trump extended its investment to other industries including casinos and golf courses. He also ventured into the entertainment industry and was the host of TV shows such as the American Reality Show Celebrity Apprenticeship. He also served as the chairman of the Miss Universe Pageant. Trump has supported Republican and Democratic major presidential candidates in the past 20 years. In June 2015, Trump took part in the 2016 U.S. presidential election as a Republican candidate. Previously, Trump had not held public positions. Trump has been married three times and has five children. On November 9, 2016, Donald Trump has won 276 electoral votes, more than 270 electoral votes, and was elected 45th President of the United States. At noon on January 20, 2017, US time, Trump took office in Washington, the capital of the United States, and officially became the 45th president of the United States. 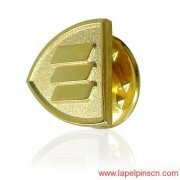 The Donald Trump lapel pins have head design, side face with his classic hair style. Making with silver metal, shinny nickel silver, the head is 3D design, words around: "LIBERTY" top and "2017" down. 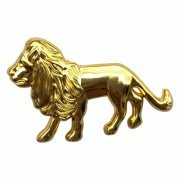 Here are similar pins: gold lions lapel pins and eagle lapel pins.